As an arborist, my preference is caring for trees rather than removing them. However, sometimes there is no choice, particularly when a broken or diseased tree is in danger of harming people or property. Unfortunately, most of these trees do become removals. Many trees live long lives with imperfect health. They experience damage from insects or disease, but manage to compartmentalize it and continue to grow and even thrive. Often we are able to help these trees with improved nutrition, better soil, and insect or disease control; their lifespans can improve by decades due to some extra care. Recently, one of our clients asked us to evaluate an old walnut tree. The 150-200 year old tree is on a beautiful estate in Larchmont, accompanied by some of the original larches that gave the town its name. The property has a long history of homeowners who care deeply about the trees, and the current owner obviously continues this tradition. It was clear that the tree had some substantial decay, but the homeowner was hoping that the damage wasn’t extensive enough to warrant removal yet. So the question was: how do we determine whether this magnificent tree had reached the point where it was too dangerous to remain? This was the time to employ one of the tools of our trade, a sophisticated piece of equipment called a Resistograph. The Resistograph allows us to chart the density of a tree, millimeter by millimeter. A tiny drill bit goes into the wood of a tree and transmits a graph indicating the resistance the drill bit encounters. This gives us a map of the tree core. We use this data along with other information to calculate the level of risk associated with the tree's potential failure. Trees are amazing structures that can continue to stay alive and grow with much of their heartwood rotted away. Because trees have their water and nutrition transport system close to the bark, the inner part of the tree serves little purpose – except to provide the core strength that keeps several tons of branches and leaves upright. Unfortunately, we had to tell this client that the walnut tree had lost so much of its core that it was no longer safe. As you can see from the picture, the Resistograph told the truth: this tree was essentially EMPTY. 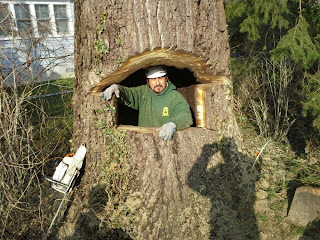 The 4’ diameter hole could easily accommodate our crew member. If you suspect one of your trees may be hollow or simply want to perform Risk Assessments for trees which you may be concerned about, Almstead arborists have the training and tools needed to gather that information so homeowners can make a properly educated decision.